Quality, rustic sleepers that are ideal for making raised beds – half the width of our full-sized sleepers to make them more convenient to use in an average sized garden. These are made from sustainably sourced heartwood Larch and are untreated (no nasty chemicals), making them perfect for vegetable gardening. PLEASE NOTE: If you need this item delivering, there is an additional charge based on distance – please see the details of delivery prices and arrangements. If you live outside of the Greater Manchester area, this item is COLLECTION ONLY. 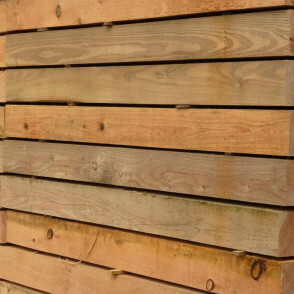 Our rustic, unplaned, sustainably sourced untreated Larch planks are a great way to add real character to your garden and create unique looking features, such as lovely raised beds for plants or veggies. They can easily help transform any garden into a grower’s paradise and can be used to create almost any size or shape beds – you can let your imagination run wild. and are ideal for where a full-sized sleeper may just be a bit too big in a typical sized garden. The sleepers are made of heartwood Larch and are ideal for making raised beds: unlike treated sleepers, ours contain no chemical preservatives that might leach into the ground and so are ideal for vegetable gardening. We primarily mill these from Larch, and sometimes Douglas Fir when we have it, but can potentially mill Oak sleepers too with notice. Oak prices will be more expensive, so please get in touch to discuss this. For our full-size sleepers, look here, or check out our smaller 50mm x 100mm planks here. We can also mill other sleeper sizes on request. To discuss these possibilities, please get in touch. We also supply bracing timbers if you are creating your own raised beds, or for use in other similar projects.